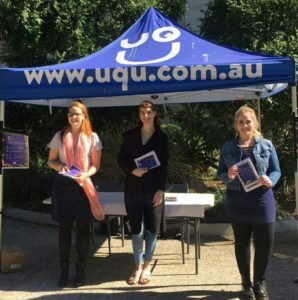 My first day at UQ was awful. I was deep in the throes of heartbreak, at the hands of a UQ student, no less. I saw the campus for the first time through the dense, distorted hue of him. Every store, each seat, glass, and table, was coloured by his presence. I wondered what associations he had with this place or that, or what memories of his lingered around the sandstones and the lakes. I had come to UQ almost on a whim. It had been in the back of my mind for years, after catching my attention in high school. But I had decided to study my undergraduate degree online. Now I was hungry for human interaction. I wanted to know my teachers and peers. Still, it felt like a mistake, coming to a place where I was such a stranger. Leisurely days spent writing assignments in bed were to be replaced with wading through the crowds of bodies on campus. I made my first friend on the second day. He was sitting on a strangely positioned bench in the middle of a garden bed. I crunched my way over rocks and fallen palm seeds to join him. We had both arrived an hour early for our lecture and had plenty of time to chat idly about our degree. I knew someone, now. And that funny little bench took on its own colour after that. Classes in the Masters of Writing, Editing and Publishing were small and friendly. I took part in discussions and was thrilled to find interesting, funny, and clever people almost everywhere I turned. Here dark lipstick, there red hair, light brown skin, blue collared-shirts. Everything came into focus. Trite conversation and trivial jokes gave nuance and meaning to the increasingly familiar classrooms. They would come to be defined by homemade trail-mix, too-cold air conditioning, squeaky chairs, and murmured jokes. A renewed passion for writing lit a fire behind my eyes. It roared, and the world gleamed in response. I frequented the Red Room, sometimes alone, and came out every time with new friends. I met people from other disciplines and had conversations (and arguments) into the night. One security guard greeted me every day on my way to and from the bus. It was hard to resist the pull of friendly faces, and the smell of hot chips triggered wailing sirens in my brain and mouth. The energy in the place was magnetic. It’s hard to imagine that I cried there on my first day. Then I fell in love with the great court, as everyone does. The grass is greener there; the sky is bluer. I would lie in the shade and try to study, always distracted by people passing by. They came in trickles and groups, and then all together at ten to the hour. I had the feeling of being at once included in everything, and entirely separate from the world. I realised that UQ was a real place, then. The long blue shadows didn’t just lie on the grass, or slowly climb the walls. They waited for the clouds to obscure the sun, then joined up into a great cold blanket and threw themselves across the court, raising goosebumps up my arms. I rolled from side to side to alleviate the itchy, red indentations of damp grass on my stomach. I closed my tired eyes and dreamed, and when I turned towards the sky I saw my eyelids glow red. Everything felt real. Then, in the evening, yellow lights lit up the walls, turning the sandstone the colour of honey, and the faint music of dancing classes drifted over the balmy air like a sickly-sweet dream. Even at the start, I knew that coming to UQ wasn’t a mistake. What overwhelmed me at first is what I came to love—the feeling of other people’s experiences reverberating around me. The campus is a kaleidoscope. As you move, it moves around you. Reach out and touch it, and it changes. You can’t lie under a Jacaranda tree, borrow a library book, or walk to class without passing through the memories of so many people before you. It’s a presence that can’t always be seen, but for those who pay careful attention, it permeates everything. Samantha McPherson is an intern with the Alumni Friends of UQ and currently studying the Masters of Writing, Editing and Publishing. This entry was posted in Bachelor of Arts, First Day, Friendship, Great Court, Life at UQ and tagged Editing, Friends, Masters of Arts, Publishing, The Great Court, The Red Room, UQ, Writing. Bookmark the permalink.